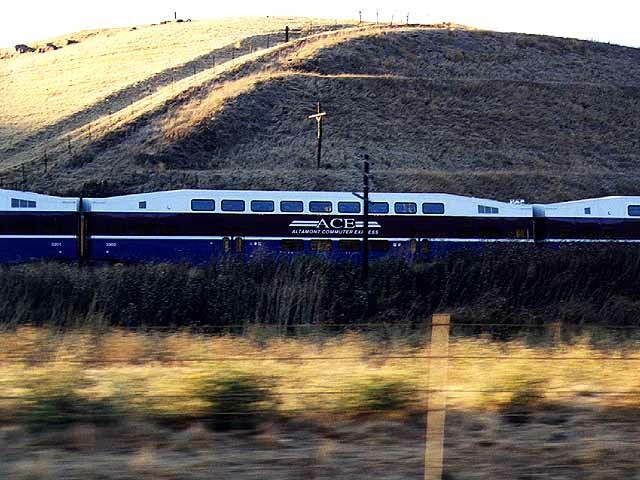 On October 19, 1998, a new era dawned in passenger rail service with the inaugural run of the Altamont Commuter Express  or ACE  between Stockton and San Jose. 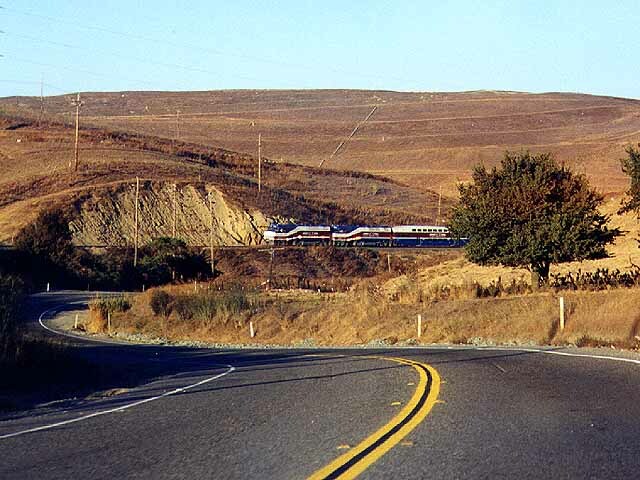 The route traverses 85 miles and is highlighted by a spectacular ride through the Altamont Pass, which three decades ago was the territory of Western Pacific's California Zephyr. 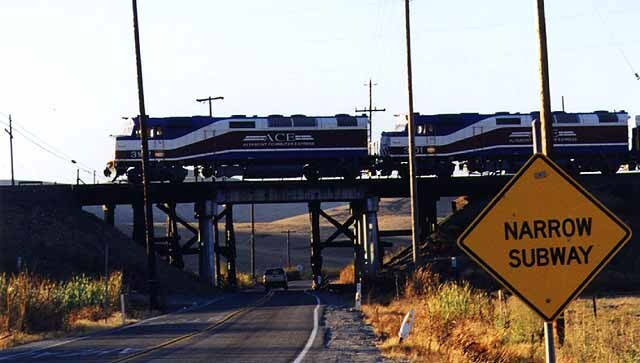 While the new trains make life easier for folks commuting to the Silicon Valley, they certainly complicate life for railfan photographers due to their pre-dawn and post-dusk schedules. The two westbounds crawl into the Pleasanton-Livermore area before 7 a.m. while the first of the eastbounds hits Altamont around 5:30 p.m. With the return to Pacific Standard Time less than a week after the trains started revenue service, we spent a balmy autumn afternoon getting as many daylight photos as we could. 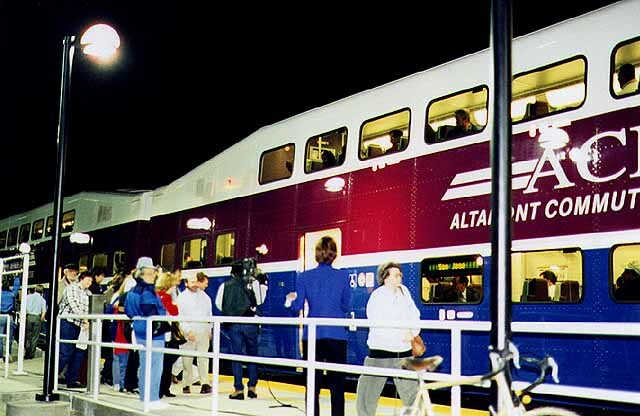 It is 6:30 a.m. and we are at Livermore for the second westbound train on the first day of revenue service, Monday, October 19, 1998. Units 3102 and 3101, rebuilt F40PH passenger locomotives, are on the point. The train crew keeps an eye on the platform as passengers board. We had hoped to shoot the first train (Train 1), but a late start from home cost us the opportunity as we saw its tail lights departing the nearby Vasco station. We camped out at Livermore for an hour in anticipation of Train 3's arrival. Photo by Roni Gehlke. Still at Livermore, we get a look at the circus atmosphere on the new passenger platform (which ACE officials refused to let us stand on unless we planned to purchase tickets, which we didn't). Passengers, ACE officials and a television news crew were all on hand for the historic occasion. The train had a fair number of passengers, but it was not overcrowded as some had feared. One bystander later referred to the colorful commuter as the "Barney train" on account of its purple livery. Photo by Roni Gehlke. 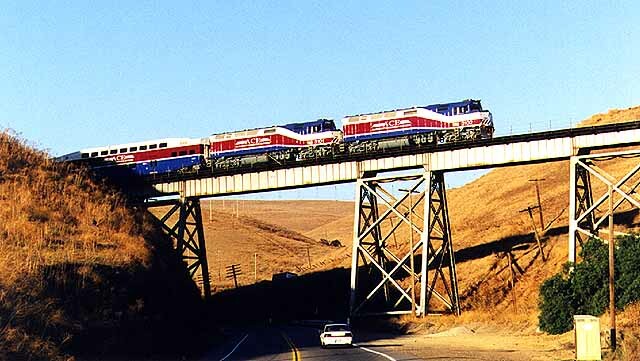 The following day, October 20, we catch up with the first eastbound run (Train 2) as it descends into Altamont Pass shortly after departing the Vasco station. The train is in "push" mode, with the locomotives bringing up the rear. It is about 5:30 p.m. and we are beginning to lose our light on this short autumn day. Photo by Roni Gehlke. The chase ensues along Altamont Pass Road. Roni is at the wheel while Glenn mans the camera. Remarkably, we are soon able to catch the train before it heads out of the pass on the Union Pacific's Canyon Subdivision. Photo by Glenn Gehlke. Here the train slips behind a bluff as we continue to gain on it. Photo by Glenn Gehlke. At last, side by side! We had the 28-80mm zoom on our Minolta Maxxum XTsi camera and boy did it get a workout. I love the motion in this shot, but it is sort of deceptive because the train was not moving all that fast. Had it been, it had enough of a head start on us from the bridge that we wouldn't have been able to get this picture at all. Photo by Glenn Gehlke. The train slips across another bridge. We had gotten ahead of the cab car by this point and had just enough time to pull into the turn lane to this side road and line up our shot. I wish I had snapped the shutter about a quarter second later, which would have framed the trailing locomotive between the line poles, but alas. Photo by Glenn Gehlke. 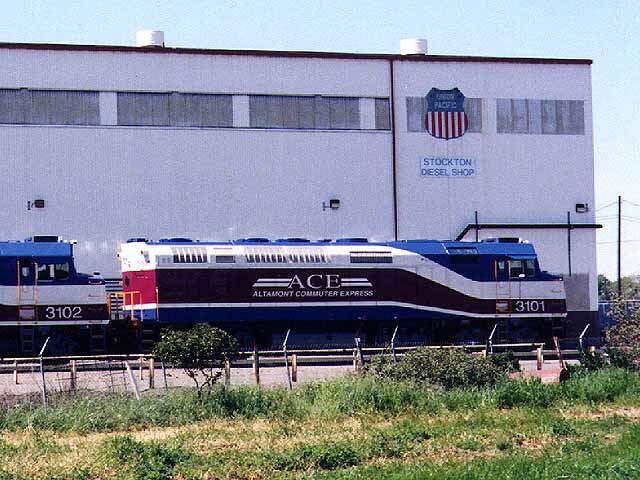 When ACE isn't running it resides behind the Stockton Diesel Shops in Union Pacific's Stockton Yard. 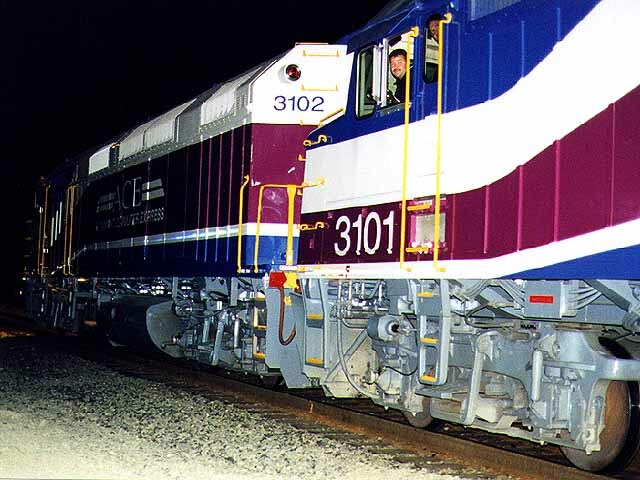 Here we see ACE 3101 and ACE 3102 in this photo taken in March 1998. Photo by Roni Gehlke. This page was last updated Tuesday, February 16, 1999 at 17:52 hrs.